On October 31, Hollywood Gothique embarked upon its final Halloween Haunt Odyssey for 2016. Having exhausted most of the familiar home haunts in Los Angeles, we were seeking terra incognita - strange lands that might unveil new terrors. East we traveled, toward the mysterious realm of Altadena, before veering toward the equator in search of spirits in South El Monte. Our quest took us to a quartet of haunted homes we had never previously encountered, including one experiencing its final manifestation before disappearing into the Graveyard of Lost Halloween Haunts. Read on for the details...if you dare! This unassuming little home haunt offered a nicely decorated yard augmented with a small scare element: trick-or-treaters seeking candy had to walk up the driveway and underneath a canopy, where a burst of fog obscured their vision, a spring-loaded spider attacked, and a human-sized bog monster appeared out of nowhere. As if that were not enough, the candy cauldron was guarded by a pair of blank-faced sisters, exhibiting the carefully cultivated immobility of mannequins - until an unsuspected costumed reveller reached for the treats, triggering a startling response from the previously quiescent figures. The decor consisted mostly of skulls, skeletons, and gravestones, but the lighting was lovely, and there was an eerie ghost floating in the window (digitally projected). The proprietor plans to expand next year. *Note: Forgotten Hollows lists its city as Pasadena, but Mapquest and Hollywood Gothique's official GPS insist the haunt is in Altadena. Apparently, Pepper Drive north of Berendo is a mecca of trick-or-treating. On Monday night, the sidewalks were crowded with ghosts and goblins long after other neighborhoods had gone dark. No doubt this sustained supernatural activity was due to the numerous houses decorated with Jack O'Lanterns, giant spider webs, and lights - all promising a wealth of treats for those brave enough to approach. 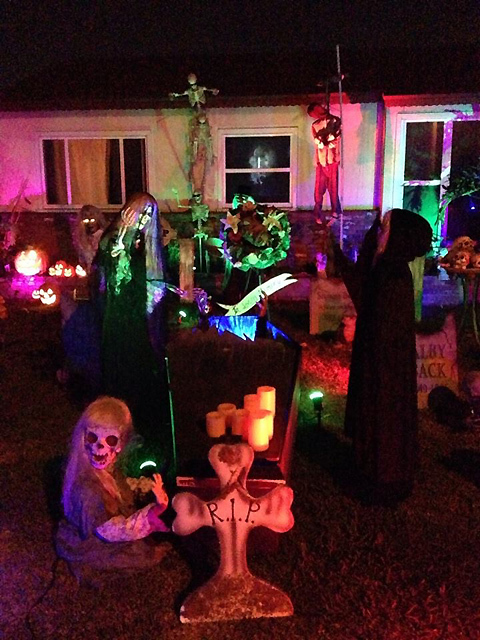 The main attraction was the Garden Path of Doom, an aptly named yard display that required costumed ghouls to ascend a twisted, treacherous cobblestone path that curved around a yard full of gravestones and up to a house with several motion-activated monsters. Along the way were several clever touches, including a talking mannequin, achieved not with wireless radio but an old-fashioned voice tube. The tiniest trick-or-treaters seemed to find the approach quite intimidating, but their parents and older compatriots were suitable impressed as well, if not quite driven to shrieks. The proprietor was nice enough to invite us inside for a few moments, informing us that the Garden Path of Doom has been haunting for a couple of decades. Thanks to assistance from the next generation, the haunt should continue for the foreseeable future, so make a note for next Halloween. Despondent skeleton ends it all at a house near Garden Path of Doom. About five minutes north of the Garden Path of Doom is - or rather, was - the Braeburn Haunt. 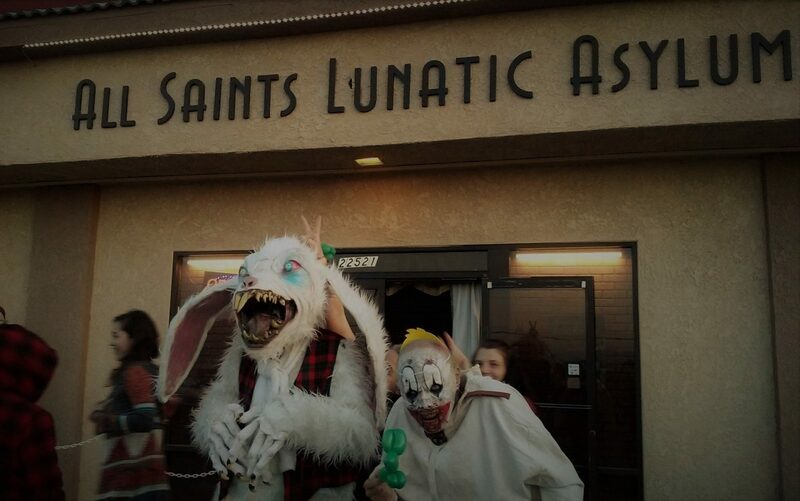 This local institution, which drew crowds in the thousands for the past sixteen Halloweens, has announced that it will go on hiatus next year while deciding when or whether to return. This is an unfortunate development for Los Angeles Halloween fans, because the Braeburn Haunt was a really big show. There are many approaches to haunting (spooky, visceral, etc); Braeburn opted for massive scale. 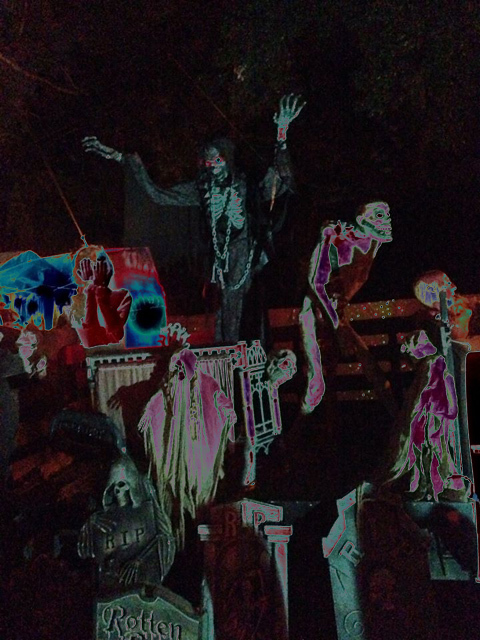 This was one huge haunt, situated on the expansive yard of an impressive house in a well-to-do neighborhood, and it wasn't exactly subtle about announcing itself; in fact, it was virtually impossible to be nearby without become aware of its baleful existence. The street was blocked off by the California Highway Patrol. Bodies hung from wires suspended over the pavement. Inflatable figures stood at the corner of the property. Grizzly tableau dotted visible sections of the yard, hinting at darker horrors lurking in those areas cut off from view. 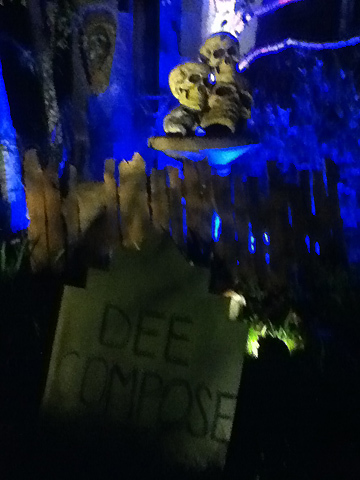 Sound effects, shrieks, and music blasted into the night air, luring curious victims from afar. The crowd stretched down the block, around the corner, and down the next block. Traffic was log-jammed on the tiny cross street, with cars giving up and trying to back out, only to be blocked by more cars coming up behind. The walk-through was constructed mostly of tarp in the front yard, and the props were largely familiar store-bought items. However, there were so many of them, and in so many combinations, that cumulative impact was anything but off-the-shelf. 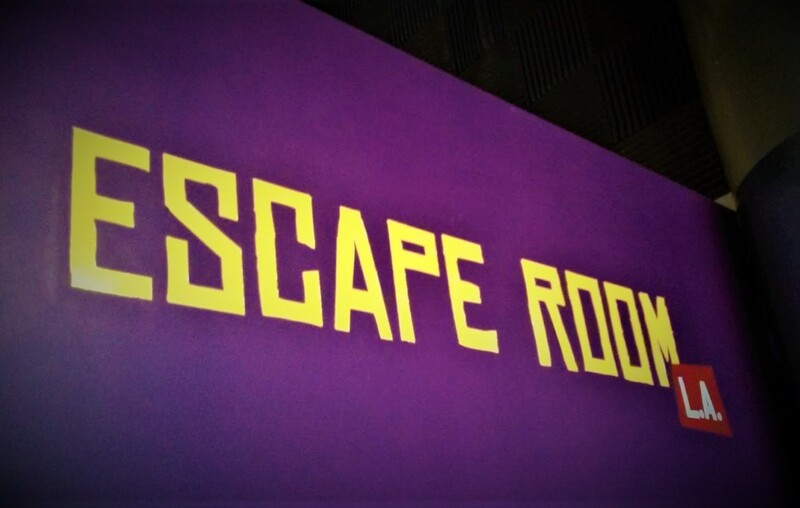 The journey was divided into multiple rooms, each inhabited by its own diabolical species, and just when we thought there could not possibly be anymore, we turned a corner to see...even more! The effect was almost comical when we finally reached the porch and realized that path would have to take us on some kind of wide u-turn to get us back to the street, taking us through yet another section - and then another - on the way out, before finally depositing us safely on the curb. Along the way, we totally lost count of the jump-scares and screams. The Braeburn Haunt has always been a one-night-only event, which is why we never managed to fit it into our schedule before. Having now experienced its terrors, we would score this as a must-see if only it were going to be around next Halloween. For now, the future remains uncertain. Owners Judy Pastor and Vance Weisbruch are planning to take two or three years off and then possible resurrect their haunt in a new form. Only time will tell whether this nightmare becomes a welcome reality. 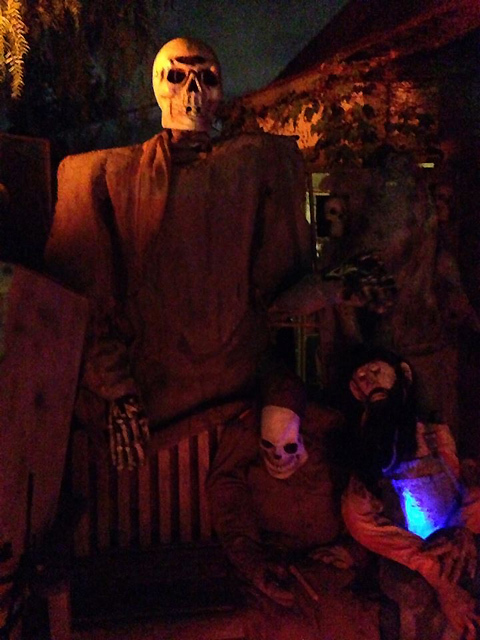 Note: We had listed this haunt under the name "Balian Mansion of Halloween" since seeing it so designated in a 2013 article at AltadenaBlog.com. Having exhausted Altadena's tricks and treats, we turned south for a long trip down Rosemead Boulevard, for our final stop of the night. Unfortunately, Haunted by Memories Manor had closed its crypt by the time we arrived, so we were not able to see it in full operation. Fortunately for us, the hospitable hosts (a newly engaged couple) were kind enough to turn the lights and sounds back on, understandably proud to show off their efforts. The front yard was dense with gravestones, skeletons, and singing Jack O'Lanterns (apparently a fashion trend this Halloween). There were several animatronic figures: a coy werewolf standing still just long enough to make it a surprise when he finally moved; a masked madman raising a severed head from a bucket; and (our favorite) a "walker" using a walker - i.e., a groaning zombie torso holding itself up by its hands, poised awkwardly over the metallic device. And thus ends our Halloween Haunt Odyssey series for 2016. The haunting, however, is not quite over. We will be back shortly with a list of attractions that remain open after October 31, including Motel 6 Feet Under, Field of Screams, and others.